Crocodiles of the World . 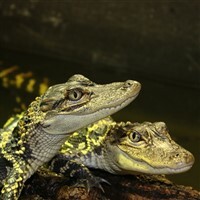 See over 100 crocodiles of more than 15 species at the UK's only crocodile Zoo. With incredible underwater viewing, come face to face with some of the most feared predators on the planet – Nile crocodiles, American alligators, black caiman, and more! Cafe and gift shop on site. See over 100 crocodiles of more than 15 species at the UK's only crocodile Zoo. With incredible underwater viewing, come face to face with some of the most feared predators on the planet  Nile crocodiles, American alligators, black caiman, and more! Cafe and gift shop on site.